Born and raised in Cleveland, Ohio, Hawkins studied classical piano as a child and learned guitar in his twenties. His initial goal was to become an opera singer (Hawkins cited Paul Robeson as his musical idol in interviews), but when his initial ambitions failed, he began his career as a conventional blues singer and pianist. He joined the US Army in 1944, and entertained troops as part of his service. After leaving the Army, he returned to music and boxing. Hawkins was an avid and formidable boxer. In 1949, he was the middleweight boxing champion of Alaska. In 1951, he joined guitarist Tiny Grimes' band, and was subsequently featured on some of Grimes' recordings. When Hawkins became a solo performer, he often performed in a stylish wardrobe of leopard skins, red leather, and wild hats. I Put A Spell On You record label. 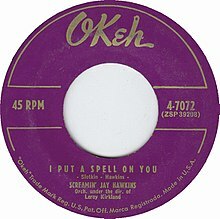 Hawkins' most successful recording, "I Put a Spell on You" (1956), was selected as one of The Rock and Roll Hall of Fame's 500 Songs that Shaped Rock and Roll. According to the AllMusic Guide to the Blues, "Hawkins originally envisioned the tune as a refined ballad." The entire band was intoxicated during a recording session where "Hawkins screamed, grunted, and gurgled his way through the tune with utter drunken abandon." The resulting performance was no ballad but instead a "raw, guttural track" that became his greatest commercial success and reportedly surpassed a million copies in sales, although it failed to make the Billboard pop or R&B charts. The performance was mesmerizing, although Hawkins himself blacked out and was unable to remember the session. Afterward he had to relearn the song from the recorded version. Meanwhile, the record label released a second version of the single, removing most of the grunts that had embellished the original performance; this was in response to complaints about the recording's overt sexuality. Nonetheless it was banned from radio in some areas. Soon after the release of "I Put a Spell on You", radio disc jockey Alan Freed offered Hawkins $300 to emerge from a coffin onstage. Hawkins didn't want to—reportedly saying "No black dude gets in a coffin alive — they don’t expect to get out!”  but reluctantly accepted and soon created an outlandish stage persona in which performances began with the coffin and included "gold and leopardskin costumes and notable voodoo stage props, such as his smoking skull on a stick – named Henry – and rubber snakes." These props were suggestive of voodoo, but also presented with comic overtones that invited comparison to "a black Vincent Price." Despite the commercial success of the gimmick, Hawkins resented the schlock-factor that made him famous. He found it exploitative, and believed it undermined his sincerity as a vocalist and a balladeer. In a 1973 interview, he bemoaned the Screamin' epithet given to him by his label Okeh records, saying "If it were up to me, I wouldn’t be Screamin’ Jay Hawkins...James Brown did an awful lot of screamin’, but never got called Screamin’ James Brown...Why can’t people take me as a regular singer without making a bogeyman out of me?" "I Put a Spell On You" became a classic cult song, covered by a variety of artists such as Creedence Clearwater Revival, Nina Simone, Alan Price, the Animals, Them with Van Morrison, Arthur Brown, Bryan Ferry, Buddy Guy with Carlos Santana, Tim Curry, Leon Russell, Joe Cocker, Nick Cave in a concert only version, Marilyn Manson, Mica Paris with David Gilmour, Jeff Beck and Joss Stone, Diamanda Galas, and Annie Lennox in 2014 for her Grammy nominated album Nostalgia. Hawkins' original "I Put a Spell on You" was featured during the show and over the credits of Episode 303 of The Simpsons. "I Put a Spell on You" was featured in the April 17, 2018 New York Times crossword puzzle. Hawkins' later releases included "Constipation Blues" (which included a spoken introduction by Hawkins in which he states he wrote the song because no one had written a blues song before about "real pain"), "Orange Colored Sky", and "Feast of the Mau Mau". Nothing he released, however, had the monumental success of "I Put a Spell on You". In Paris in 1999 and at the Taste of Chicago festival, he actually performed "Constipation Blues" with a toilet onstage. He continued to tour and record through the 1960s and 1970s, particularly in Europe, where he was very popular. In February 1976 he suffered facial injuries when he was burned by one of his flaming props while performing with his guitarist Mike Armando at the Virginia Theater in Alexandria, Va. . He appeared in performance (as himself) in the Alan Freed bio-pic American Hot Wax in 1978. Subsequently, filmmaker Jim Jarmusch featured "I Put a Spell on You" on the soundtrack – and deep in the plot – of his film Stranger Than Paradise (1983) and then Hawkins himself as a hotel night clerk in his Mystery Train and in roles in Álex de la Iglesia's Perdita Durango and Bill Duke's adaptation of Chester Himes' A Rage in Harlem. His 1957 single "Frenzy" (found on the early 1980s compilation of the same name) was included in the compilation CD, Songs in the Key of X: Music from and Inspired by the X-Files, in 1996. This song was featured in the show's Season 2 episode "Humbug". It was also covered by the band Batmobile. In 1983, Hawkins relocated to the New York area. In 1984 and 1985, Hawkins collaborated with garage rockers the Fuzztones, resulting in Screamin' Jay Hawkins and the Fuzztones Live album recorded at Irving Plaza in December 1984. They perform in the 1986 movie Joey. In 1990, Hawkins performed the song "Sirens Burnin'," which was featured in the 1990 horror film Night Angel. In July 1991, Hawkins released his album Black Music for White People. The record features covers of two Tom Waits compositions: "Heart Attack and Vine" (which, later that year, was used in a European Levi's advertisement without Waits' permission, resulting in a lawsuit), and "Ice Cream Man" (which, contrary to what one might suppose, is a Waits original and not a cover of the John Brim classic). Hawkins also covered the Waits song "Whistlin' Past the Graveyard", for his album Somethin' Funny Goin' On. In 1993, his version of "Heart Attack and Vine" became his only UK hit, reaching #42 on the UK singles chart. When Dread Zeppelin recorded their "disco" album, It's Not Unusual in 1992, producer Jah Paul Jo asked Hawkins to guest. He performed the songs "Jungle Boogie" and "Disco Inferno". He also toured with the Clash and Nick Cave during this period, and not only became a fixture of blues festivals but appeared at many film festivals as well, including the Telluride Film Festival premiere of Mystery Train. In 2001, the Greek director and writer Nicholas Triandafyllidis made the documentary Screamin' Jay Hawkins: I Put a Spell on Me about various stages of his life and career, including a filming of his last-ever live performance, in Athens on December 20, 1999, two months before his death, following a performance the day before in Salonica. In the documentary notable artists such as Jim Jarmusch, Bo Diddley, Eric Burdon, Frank Ash, Arthur Brown and Michael Ochs talked about Screamin' Jay Hawkins' early life, personality and career, and about his incredible talent. Hawkins had six marriages; his last wife was 31 at his death. Singing partner Shoutin' Pat Newborn stabbed him in jealousy when he married Virginia Sabellona. He had three children with his first wife and claimed variously to have 57 or 75 in total. After his death, his friend and biographer Maral Nigolian set up a website to trace these children, identifying 33, at least 12 of whom met at a 2001 reunion. Hawkins died after emergency surgery for an aneurysm on February 12, 2000, in Neuilly-sur-Seine, France, near Paris, approximately five months before he would have reached the age of 71. Although Hawkins was not a major success as a recording artist, his highly theatrical performances from "I Put a Spell on You" onward earned him a steady career as a live performer for decades afterward, and influenced subsequent acts. He opened for Fats Domino, Tiny Grimes and the Rolling Stones. This exposure in turn influenced rock acts such as Alice Cooper, Tom Waits, the Cramps, Screaming Lord Sutch, Black Sabbath, Creedence Clearwater Revival, Arthur Brown, Led Zeppelin, Marilyn Manson, Rob Zombie and Glenn Danzig. ^ a b c d e Jeremy Simmonds (2008). The Encyclopedia of Dead Rock Stars: Heroin, Handguns, and Ham Sandwiches. Chicago Review Press. pp. 427–428. Retrieved December 4, 2008. ^ a b c d Vladimir Bogdanov; Chris Woodstra; Stephen Thomas Erlewine (2003). All Music Guide to the Blues: The Definitive Guide to the Blues. Backbeat Books. p. 226. Retrieved December 4, 2008. ^ Tosches, Nick (1991). Unsung Heroes of Rock 'n' Roll: The Birth of Rock 'n' Roll in the Wild Years Before Elvis. New York: Harmony Books. p. 158. ISBN 0517580527. ^ a b c Edward M. Komara (2006). Encyclopedia of the Blues: A-J. Routledge. p. 415. Retrieved December 4, 2008. ^ a b c d e Ed Sikov (1996). Laughing Hysterically: American Screen Comedy of the 1950s. Columbia University Press. p. 17. Retrieved December 4, 2008. ^ Whitburn, Joel (2003). Top Pop Singles 1955–2002 (1st ed.). Menomonee Falls, Wisconsin: Record Research Inc. ISBN 0-89820-155-1. ^ Whitburn, Joel (1996). Top R&B/Hip-Hop Singles: 1942–2004. Menomonee Falls, Wisconsin: Record Research. ISBN 0-89820-115-2. ^ Amlen, Deb (April 17, 2018). "Much Covered Song". The New York Times. ISSN 0362-4331. Retrieved April 19, 2018. ^ Patricia Romanowski Bashe, Holly George-Warren, and Jon Pareles, The Rolling Stone Encyclopedia of Rock & Roll: Revised and Updated for the 21st Century (Fireside, 2001), 419. ^ Cesare Rizzi, Enciclopedia della musica rock (Giunti, 1996), 249. ^ Maslin, Janet (January 31, 1986). "Screen: 'Joey,' Rock Tale". The New York Times. Archived from the original on July 10, 2012. ^ Edward M. Komara, "Hawkins, Screamin' Jay", Encyclopedia of the Blues (Routledge, 2006), pp. 415–416. ^ Peter Buckley, The Rough Guide to Rock (Rough Guides, 2003), 207. ^ Copyright: Waits v. Levi Strauss Archived November 16, 2007, at the Wayback Machine at Tom Waits Library. ^ Betts, Graham (2004). Complete UK Hit Singles 1952–2004 (1st ed.). London: Collins. p. 346. ISBN 0-00-717931-6. ^ a b "Screamin' Jay Hawkins: I Put a Spell on Me (2001)". IMDb.com. Retrieved December 25, 2012. ^ a b c d Wolf, Buck (February 4, 2001). "Screamin' Jay's Illegitimate Family Reunion". ABC News. Retrieved November 23, 2014. ^ "Jayskids.com". Archived from the original on February 2, 2001. Retrieved November 23, 2014. ^ Feature: Screamin' Jay Hawkins, All Things Considered, January 1, 2001. ^ Ashyia N. Henderson (2001). Contemporary Black Biography. Gale Group. p. 83. ISBN 9780787646189.